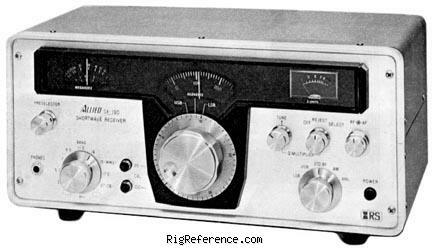 The RadioShack AX-190 (also sold under the Allied brand name) is a general coverage receiver. It covers all short-wave bands between 80 and 10 meters (3.5-4, 5.7-6.2, 7-7.5, 9.5-10, 11.5-12, 14-14.5, 15-15.5, 17.5-18 and 27-27.5 MHz) plus one optional 500 kHz band. An external speaker was available in the form of the SP-190. ¼" Head. Jack, S-Meter, Preselector, NL, Calibrator, AGC, Q-Multiplier, Record Jack, Mute Line, RF Gain, HFO Output. Estimating the value of a rig can be challenging. We collect prices paid by real hams over the years to help you estimate the current value of the RadioShack / Realistic SX-190. Just bought or sold this model? Let us know what you traded it for and help other ham operators!